The gates are open and the roads to Drieghan are ripe for exploring. Get ready to check out this exciting new land, home to the new world boss, Garmoth. There are new awakening weapons, field boss, a baby dragon to call your own, and so much more! To celebrate this release we have a slew of events to help you get into the dragon slaying mood. Celebrating Millions continues with part 3: Enjoy Blessed Message Scrolls, a substantial EXP boost, and the grand finale with a fireworks display! All of these wonderful changes and more await you in the rest of the patch notes so continue on and see what else we have in store! -During the event period, play for 100 consecutive minutes to complete the event Challenge and get Blessed Message Scroll (100 min) x1. -During this special weekend, enjoy 1,000% Combat EXP boost! -Check the event page for exact schedule. -During this grand finale, enjoy the fireworks display from the coast of Velia. • Please click <Here	> for the full details on this conclusive part 3 of the Celebrating Millions event! ◈ During the event period, defeat Monsters, Fish, and Gather in all areas of Black Desert online to collect [Event] Drieghan Seal. ◈ Usage of [Event] Drieghan Seal? • Usage 1: From your Processing window, select Shaking and perform Shaking with [Event] Drieghan Seal x10 to get [Event] Drieghan Military Supply Box I x1. -Beast's Draught x1-2, Giant's Draught x1-2, Verdure Draught x1-2, Elixir of Sharp Detection x1-5, Elixir of Steel Defense x1-5, Elixir of Flowing Time x1-5, Splendid EXP Elixir x1-5. Elixir of Endless Fury x1-5, Superior Whale Tendon Potion x1, Whale Tendon Potion x1-2. • Usage 2: From Processing window, select Simple Alchemy and perform Simple Alchemy with [Event] Drieghan Seal x20 to get [Event] Drieghan Military Supply Box II x1. -Sharp Black Crystal Shard Bundle: 3, Hard Black Crystal Shard Bundle: 3, Sharp Black Crystal Shard, Hard Black Crystal Shard, Memory Fragment, Cron Stone, Black Stone (Weapon) x1-2, Black Stone (Armor) x1-2. • Part 1: 11/14 After Maintenance ~ 11/28 Before Maintenance: Enjoy a special daily quest requested by Imperial Chefs! • Part 2: 11/21 After Maintenance ~ 11/28 Before Maintenance: Face off against the menacing King Targargo in Fleme Hills of Velia. • Click < Here > to find out how to get more turkey in detail. • During this special period, receive 5 times the silver rewards and Guild Skill EXP for completing Guild Missions! ◈ Loyal Attendance Rewards have been refreshed. ◈ Double Boss Drop: 11/7 After Maintenance ~ 11/28 Before Maintenance. • Check out the updated event page with Garmoth added into the event! • Click < Here > for the updated boss timetable with Garmoth and Targargo! • Be sure to right click on the Rulupee’s Ratty Flag you have obtained to learn what to do next! Don’t forget to get your Sealed Drieghan Treasure Chest while exploring the new Drieghan region. ◈ Bonus Back event distribution has been given out during the maintenance. Please check your mailbox (B) for your bonus back rewards! ◈ New region, Drieghan, has been added. • New Nodes and NPC’s have been added to Drieghan, and new knowledge topics have been added for them. • Drieghan is opened to all adventurers. 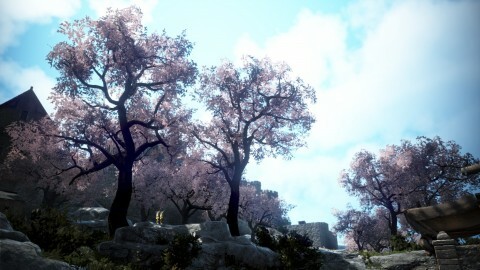 Adventurers will be able to explore the entire area more conveniently if Kamasylvia has already been conquered. 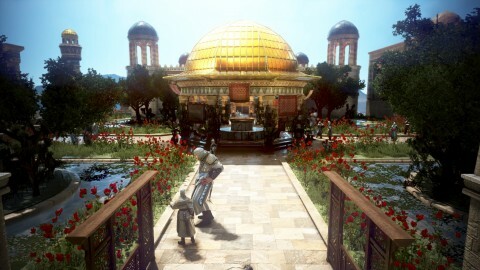 • You will not get diseases such as heat strokes or hypothermia in Drieghan, so don’t worry about getting sick. • There are indoor and outdoor hot springs in Duvencrune, a large city within Drieghan. Your characters can receive special effects by going into the hot springs. • Duvencrune’s indoor hot springs have a capacity of up to 5 adventurers, and the outdoor hot springs have a capacity of up to 10 adventurers. Adventurers who enter after the maximum capacity has exceeded will not receive any of the effects from the hot springs. • Characters Lv 58 or higher who have completed 'Heart of Kamasylve' quests can receive the ‘[Drieghan] A Message from the Queen’ quest from the Black Spirit. This quest provides you a guide for the Drieghan region. ◈ The new world boss ‘Garmoth, the Crimson Dragon’ has been added. • Garmoth, the Crimson Dragon appears 3 times per week (exact times can be found via our official boss timetable < Here >) from Garmoth's Nest of all world servers excluding Olvia and Arsha. • When the notification message for the appearance of Garmoth, the Crimson Dragon appears, Kagtum Tribe monsters (worshippers of Garmoth) will appear along with sculptures. Garmoth will appear as you begin to destroy the sculptures. • When 30 minutes passes after you begin fighting Garmoth, Garmoth will disappear when she is no longer in a combat status. • Whenever Garmoth’s HP decreases lower than a certain point, a system message will appear and a random sculpture will be activated among the remaining sculptures. Garmoth will disappear after 30 minutes passes, even after this pattern begins. • Garmoth utilizes various aerial pattern attacks and deals powerful area damage, so adventurers must be well prepared. • When defeated, Garmoth flies away into the sky and leaves behind loot. Adventurers who provide significant contribution during the battle will be able to obtain various items such as Garmoth’s Heart, which gives you a chance to reform Nouver or Kutum’s Sub-weapon. ◈ The new pet, ‘Young Crimson Dragon’, has been added. • You can obtain the Young Crimson Dragon by exchanging the ‘Garmoth’s Horn’ item from NPC Gerson. Garmoth’s Horn can be obtained by defeating Garmoth, the boss monster. -You can exchange it to randomly obtain one of the five items below. • Just like the other pets, you can right-click on the item to register and use. • The item can be registered at the Marketplace. The Max Price and Min Price are 300 million and 100 million Silver, respectively. • You can only summon one Young Crimson Dragon each time. • The Young Crimson Dragon is initially Tier 1. You can increase the tier through exchanging as you collect more Young Crimson Dragons. • The Young Crimson Dragon has a talent of Increase Max HP, and for each tier increase it increases to 25/50/75/100. • The Young Crimson Dragon pets are "Special" type pets. They are the only Special type pets currently available so they can only be exchanged with each other. They cannot even be exchanged with Wizard Gosphy. • Click < Here > to see how you can earn your very own young crimson Dragon in detail! ◈ The new field boss monster Katzvariak has been added. • Katzvariak appears from the hills north of Tshira Ruins at Drieghan. • The monster disappears if there is no battle for 2 hours after its appearance. 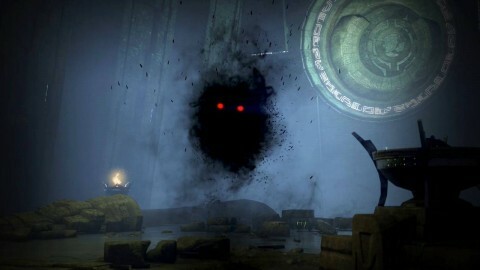 • Once defeated, you can obtain various loot such as Eye of the Ruins Ring and 3 types of Combined Magic Crystals. ◈ The maximum character limit for your team name in Arena of Arsha has been increased. ◈ Invitation to Arena of Arsha will now be able to be accepted by a character with negative Karma. ◈ A new guild skill which provides a buff for all guild members for a certain amount of time has been added. In Black Desert Online, guilds are not only where you can find fellow adventurers to embark on a journey with, but also where you can share various useful information with each other. Guilds can grow into stronger guilds depending on the efforts of its guild members, and it’s also a system in which guild members can receive the benefits of higher daily wages and guild bonuses as their guild grows. Throughout the years of the game service, the amount of wealth guilds could accumulate through Node Wars and Conquest Wars has greatly increased. However, there were smaller guilds and newer guilds which had difficulty participating in Node Wars or Conquest Wars. 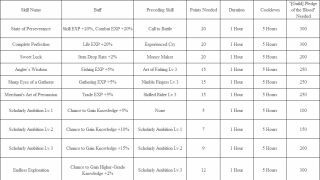 Completing Guild Quests was not enough for these guilds to collect as much Guild Skill EXP and funds as the more advanced guilds. 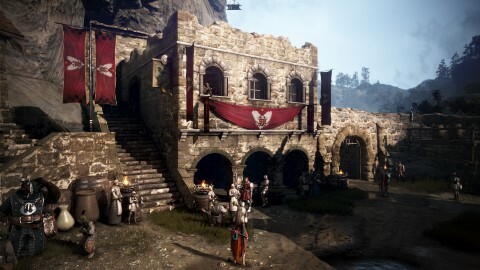 Since the Guild Funds are directly related to the amount of daily wages or bonuses given out to individual guild members, many adventurers only tried to join guilds which were already advanced. We want to gradually make improvements to this system so that adventurers can be encouraged to create many new guilds, and also actively recruit fellow adventurers. As a first step, we’ve started an event where you can obtain the EXP and funds received for completing Guild Quests 5 times more compared to before. Though this will equally benefit all guilds, we expect newly created guilds to especially benefit from this change and experience faster growth. If you’re a part of a guild which is already quite advanced, then you should look out for the newly added guild skill. Unlike the existing guild skills which are mostly passive skills, the new guild skill provides a buff which can be used by all the guild members. Furthermore, guild members will be able to select the desired type of skill depending on the situation for the perfect timing. You can also expect more new skills in the future. We are also preparing to revamp Guild Quests, the way the quests are accepted, and the rewards for completing the quests. ◈ You can check out the new guild skill from the Guild Skills Information tab from the Guild window (G). ◈ In order to acquire the new guild skill, the guild must have already acquired certain guild skills. 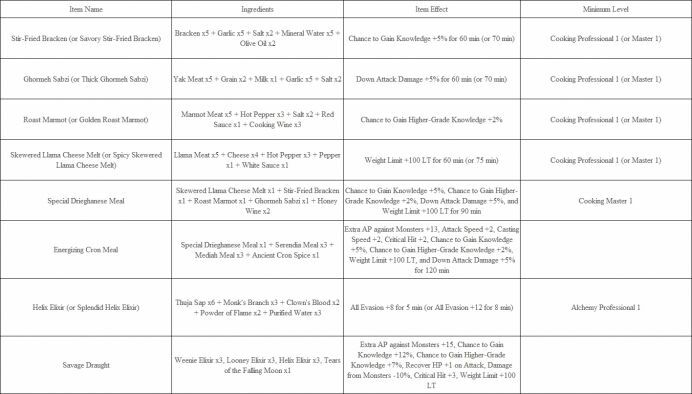 ◈ can consume the [Guild] Pledge of the Blood item to receive various buffs. 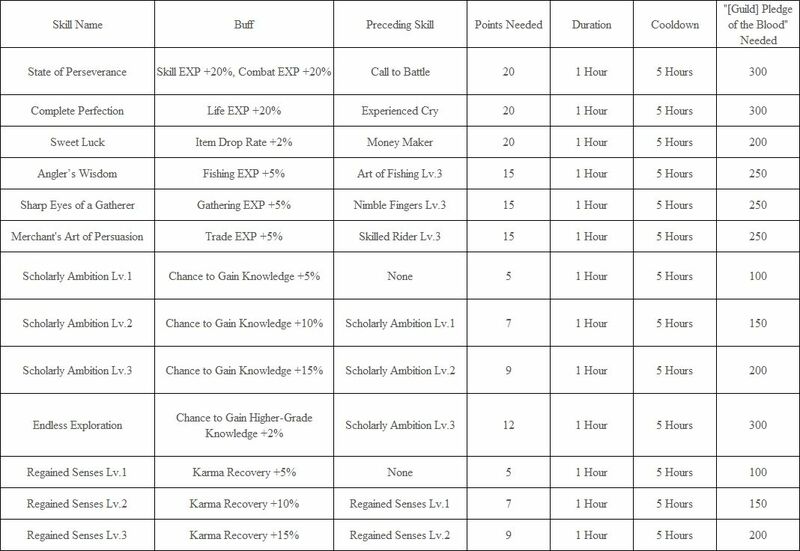 ◈ The following Guild skills have been added. ◈ Client crashing and lag issues that occurred intermittently in large-scale battles, Node Wars, and Conquest Wars have been improved. ◈ Fixed the issue where the grass would not get stained by blood intermittently in Remastered or Ultra Mode. ◈ Fixed the issue where too much blood splattered on the grass during combat in Remastered Mode or Ultra Mode. ◈ Fixed the graphical awkwardness with the trees in Longleaf Tree Forest. ◈ Fixed the naming of certain NPCs located in Glish to match with the NPCs’ appearance. ◈ Fixed the graphical issue of the NPC Patton Dairuch’s appearance looking awkward. ◈ Information about your Ship that has been taken out will now show up on top right corner of the Wharf when clicking the Wharf menu with a Ship taken out. ◈ Fixed the issue where the buttons for Ships stored would be displayed first instead of the Ship in use when using the Wharf function. ◈ Fixed the text inconsistency between the Mount Information UI seen on the ship and at the Wharf when referring to Durability. ◈ Fixed the graphical awkwardness that appeared on the character’s main weapon when unmounting a horse in combat mode. ◈ The character will go into combat mode now if the character moves forward after unmounting a horse while moving. ◈ Fixed the issue where characters get inflicted with a hit when performing Social Action while mounted on certain mounts such as Epheria Sailboat, Hwacha, Flame Tower, etc. ◈ Fixed the issue where using ESC key to close the Mount window after checking an item information by putting the mouse over did close the Mount window. ◈ Fixed the text error in the Wharf information window. ◈ Fixed the issue where Galleys appeared to have be taken out even when they weren’t if they were selected in the Guild Wharf UI. 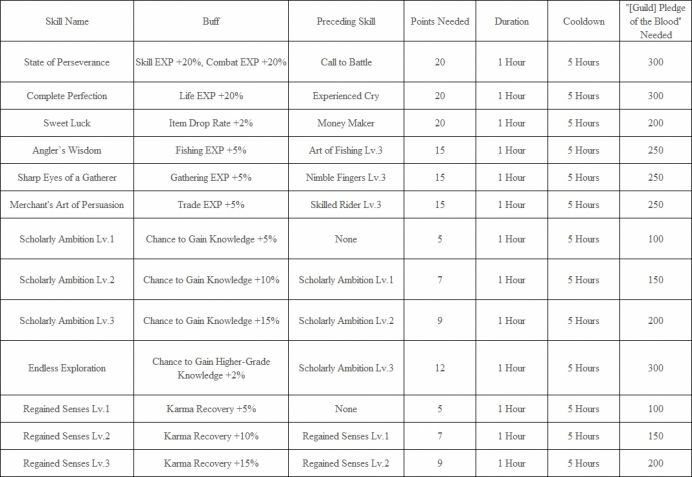 ◈ Fixed the awkwardness of the outlines that separate the skills in the Skill window (K). ◈ Fixed the graphical awkwardness of the character’s facial expression when performing the Social Action, Surrender. ◈ Fixed the issue where a character in combat/non-combat mode would change after the character performs a Cheer motion for obtaining a specific item. ◈ It has been fixed so that the character would remain in combat mode when jumping onto a wall or cliff and then jumping right off them. ◈ Fixed the graphical issue with the outer appearance of the Harpoon upon equipping Terrmian Harpoon. ◈ Fixed the graphical issue where the outer appearance of the Harpoon would not be visible when moving to land from sea with a Harpoon equipped. ◈ Fixed the issue where the dye would not apply to certain slots when dying Blanchard Gloves for female characters. ◈ Fixed the issue where the blue potion effect for the chest area would not be displayed when equipping the Pavilla Costume with female characters. ◈ Fixed the issue where the skill Heavy Strike did not work intermittently upon using the skill on mount while having learned Absolute: Piercing Spear. ◈ Fixed the issue where the graphical effect would not disappear even when the skill Blasting Gust was cancelled in progress. ◈ Fixed the issue where the character would go into non-combat mode after using the skill Mark of the Shadow on mount. ◈ Fixed the issue where the chest area would appear awkward when equipping the [Sorcerer] Karlstein Outfit. ◈ Fixed the issue where hiding Cape Setting did not work while having the Treant Camouflage outfit equipped. ◈ Fixed the graphical issue of where a part of the [Berserker] Arken Gloves would appear to penetrate through the gloves. ◈ The Tamer will now be able to mount the Heilang at anytime after using the Command: Stay. ◈ Fixed the skill description of Leaf Slash to be more accurate. ◈ Fixed the issue where the character would still be holding a weapon when switching to non-combat stance while running in a combat stance. ◈ Fixed the issue where the Jousting Helmet would be displayed upon turning on Visor Setting after taking off the Jousting Outfit. ◈ Fixed the graphical issue of the harpoon of the [Valkyrie] Thick Harpoon appearing awkward. ◈ Fixed the graphical issue of the neck area appearing abnormal when equipping the [Wizard] Cavaro Helmet. ◈ Fixed the issue where the skill Divider did not work intermittently when using the skill on mount moving forward. ◈ Fixed the graphical issue where the collar area would look awkward when the character turned its head while prone with the [Musa] Basic Outfit equipped. ◈ Fixed the issue where the skill Sah Spree of Sonan would only activate 1 hit even when there was enough WP for the skill. ◈ Fixed the issue where the effect on the cube attached to the costume and book would not be displayed when equipping [Kunoichi] Pavilla Costume. ◈ Fixed the issue where the camera would not properly show the Equipment Part selected to be dyed upon on Dye window (J). ◈ Fixed the graphical issue of the harpoon of the [Dark Knight] Thick Harpoon appearing awkward. ◈ Fixed the issue where the camera would not properly show the shoe part selected to be dyed upon on Dye window (J). ◈ Fixed the issue where the normal skill Ferocious Assault would not work when Black Spirit's Rage was deactivated. ◈ The item tooltip for [Striker] Crown Eagle Classic Set has been fixed to mention that the set contains weapons. ◈ Fixed the graphical awkwardness of the Mystic’s facial expression when perched on a surface. ◈ Fixed the graphical glitch in the chest area that occurred when customizing to the minimal chest size and having equipped [Mystic] Zebra Underwear. ◈ Fixed the issue where the camera would not show the normal helmet when selecting normal helmet from the Dye window (J). ◈ When dying the Crown Eagle Gauntlet, the parts of the same material will now share the same slots. ◈ Fixed the issue where certain motions would appear awkward when having equipped the Crown Eagle Outfit. ◈ Fixed the graphical issue where Bheg's Gloves did not turn invisible after equipping Crown Eagle Gauntlet. ◈ Fixed the graphical issue with the feathers on the shoulders of Crown Eagle outfit during combat stance. ◈ Fixed the graphical issue with the Crimson Glaives when in the Awakening combat stance wearing the Anemos outfit. ◈ New ways to reform Nouver/Kutum Sub-weapons have been added. 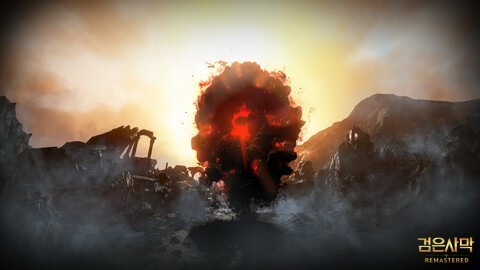 • The Fiery Nouver/Kutum Sub-weapon can be obtained by upgrading the Inverted Heart of Garmoth as a material from the Black Spirit’s Item Reform menu. 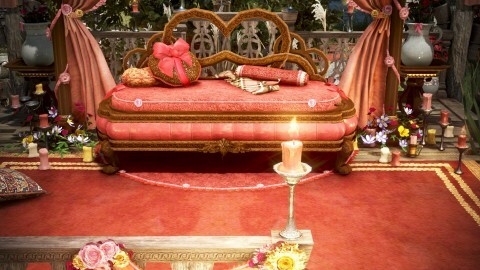 • Reform can be done regardless of the Enhancement Level, and the durability and equipped crystal will be maintained. • The Inverted Heart of Garmoth can be obtained by heating an Inverted Energy and Garmoth's Heart. • The following effects will be added by reforming the Fiery Nouver/Kutum Sub-weapon. ◈ A new boss armor, ‘Leebur’s Gloves’ has been added. • It can be obtained by defeating Leebur who is summoned through the Blood Wolf Boss Summon Scroll. ◈ New crafting weapons Hughol’s Awakening Weapon and Dragon Slayer Awakening Weapon have been added. • Hughol’s Awakening Weapon and Dragon Slayer Awakening Weapon can be crafted from the Duvencrune Weapon Workshop at Duvencrune 5. • Materials other than the Blueprint can be obtained through crafting. You can use the Crafting Notes in the menu after pressing ESC to view details on how to craft. ◈ The following Marni's Stones have been added. ◈ New blue grade armor, Akum armor, has been added. • Akum armor can be obtained by defeating monsters throughout the Drieghan region, and it has similar defensive effectiveness as Grunil and Rocaba armor. • Set effects will be applied when equipping Akum armor with blue grade Awakening Weapons. • Akum armor can be reformed with the Ultimate Armor Reform Stone. ◈ New item ‘Dragon Scale Fossil' has been added. • The Dragon Scale Fossil can be obtained at Monster Zones throughout the Drieghan region. • You can trade 30 Dragon Scale Fossils for Advice of Valks (+20) from <Trina Knights Master	> Valks NPC at Calpheon City. ◈ The higher ranked version of the Adventurer's Tome item has been added. The item is called 'Chenga - Sherekhan Tome of Wisdom'. • You can obtain Chenga - Sherekhan Tome of Wisdom through Simple Alchemy of Adventurer's Tome and Chenga Crystal of Wisdom. 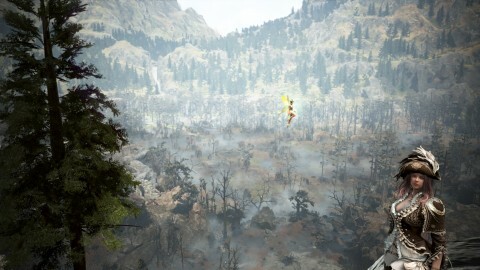 • Chenga Crystal of Wisdom can be obtained by completing the new suggested quest of Drieghan called ‘Hoom's Song’, which is a consecutive quest. • The Hoom's Song consecutive quest can be obtained from Aljai NPC located at Macalod Hill, which is on top of Khimut Lumber Camp. It can be obtained once you complete the ‘Black Spirit's Gift (Adventurer's Tome)’ quest which is obtainable upon reaching Lv. 53. • When equipping Chenga - Sherekhan Tome of Wisdom, the following effects will be applied: Combat EXP Gain from performing quests +30%, Prognyl Silver Bar Gain +20%, Vision Range +150M. ◈ Combined Magic Crystal has been added. ◈ Garmoth's Scale can be obtained from Monster Zones in Drieghan. ◈ 3 new Accessories have been added. ◈ The new crystal, Dark Red Fang Crystal has been added. • The Dark Red Fang Crystal - Armor/Valor can be obtained through Simple Alchemy of Kagtunak and Black Magic Crystal - Armor/Valor. • Kagtunak can be obtained from the Monster Zone of Drieghan, and can also be crafted through Alchemy. However, you must have knowledge of Kagtunak for the Alchemy. ◈ Food, Elixir, and Draught which can be crafted with Drieghanese materials or ingredient have been added. • Cron Meal and Draught can be crafted through Processing - Simple Cooking/Simple Alchemy. ◈ The following types of hide can be gathered using a Tanning Knife in Drieghan. ◈ The following types of blood can be gathered using a Fluid Collector in Drieghan. ◈ The following furniture can be gathered from Butchering. ◈ The following furniture can be crafted at Duvencrune 9-2. ◈ Due to an increasing demand for good quality alchemy products, alchemy boxes have started to command higher prices in all regions. 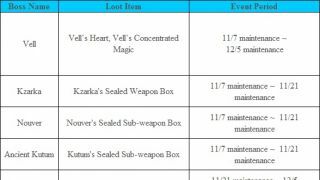 • The value of the following alchemy boxes has been increased by 20%. ◈ Due to an increasing demand for good quality food, cooking boxes have started to command higher prices in all regions. • The value of the following cooking boxes has been increased by 15%. ◈ A new consumable item Small Atanis Firefly has been added. • Right-click to release the firefly and brighten up your surroundings for 30 minutes. • Small Atanis Firefly can be purchased from a General Goods Vendor. • The cooldown of Small Atanis Firefly is 5 minutes. 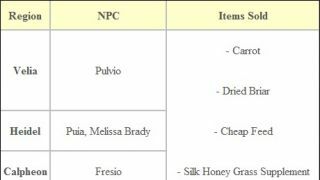 ◈ Fixed the issue where Silk Honey Grass Supplement and Brady's Supplement Powder would not be shown on the Crafting Notes. ◈ For details on newly added Pearl Shop Update, please click < Here > ! ◈ A new chief monster, Kuhvariak, has been added to the Tshira Ruins of the Drieghan region. • Kuhvariak is very powerful, so a party is recommended, and up to 5 players can receive rewards. ◈ New monsters for Hunting have been added to areas of Drieghan. • When you butcher these monsters after defeating them, you will have a chance to obtain a taxidermy decoration. ◈ New monsters have been added to the Drieghan region. • The main Monster Zones are Sherekhan Necropolis, Tshira Ruins, and Blood Wolf Settlement. • The difficulty level for each Monster Zone is different, and you can enjoy various combat situations, from small scale to large scale. ◈ There is a Traitor's Jail located at the Blood Wolf Settlement area of Drieghan. • When you destroy Traitor's Jail, the Kagtum Prisoner escaping from the jail will give a random buff for 30 seconds to the adventurer, and will follow and participate in combat for 1 minute. • If there are already 10 or more Kagtum Prisoners following, then no more Kagtum Prisoners will appear even when the jail has been destroyed. ◈ There is a Kagtum Guard located at the Blood Wolf Settlement of Drieghan. • There will be a chance for the Katgum Guard to appear along with a notification message when there are more than 5 Kagtum Prisoners following around the adventurer. • Adventurers will fight the Katgum Guard once all the 15 Warders summoned by the Katgum Guard have been defeated. If the Warders are not defeated within a certain amount of time, the Katgum Guard will disappear without fighting the adventurer. 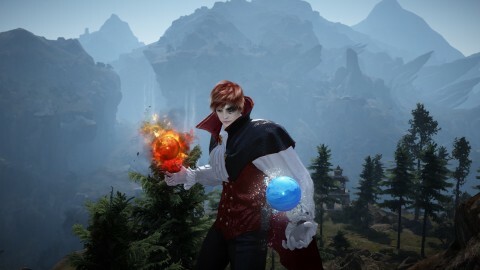 ◈ Black Energy Residue will be obtainable when defeating monsters throughout all of the Black Desert world. • There will be a slightly higher chance to obtain the Black Energy Residue within the Drieghan region. The Black Energy Residue can be crafted into the Refined Black Energy Residue from the Duvencrune Weapon Workshop at Duvencrune 5. • The Refined Black Energy Residue is used as a material for crafting Hesed's Crystal or as a material for restoring the Max Durability of a Dragon Slayer weapon. ◈The Wasteland Iguana lost and wandering aimlessly in near western gateway of Altinova has been sent home into the grass. The following loot you can obtain from defeating Mirumok Destroyer Offin has been changed. • Both of these items will be sold at a same price at NPC shops. ◈ Fixed the issue where the following monsters at sea could be inflicted hit when returning to its original spawn point for being too far away. • Candidum, Nineshark, Black Rust, Hekaru, Ocean Stalker, Goldmont Small Battleship, Goldmont Medium Battleship, Young Candidum, Young Nineshark, Young Black Rust. ◈ If your character is at least Lv. 58 and Cooking Skilled 6, and have completed the Drieghan main quests and [Co-op] Defeat the Weakened Belmorn! you can go to Jordine Ducas at the Fountain of Origin for the following quests. 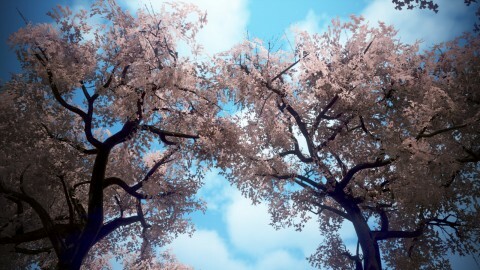 ◈ If you have learned all the knowledges under the category Foreigners of Drieghan, your max Energy will increase by 2. ◈ If you have learned all the knowledge under the category Drieghan Mythology: Chenga Sherekhan, your max Energy will increase by 2. ◈ Complete the following exploration quests with Rulupee to get back the money she swindled from adventurers in the quests Adventurer and Old Moon Adventurer Fund. ◈ If your character is at least Lv. 58 and has completed the Drieghan main quests, complete the following series of quests to get Inventory +2 Expansion as the final reward. The first quest of the series can be accepted from NPC Odelphin in Duvencrune. This quest series can be done once per character. • I Want to Be Like Father! ◈ Guild subjugation quests are available to fight Drieghanese monsters at Tshira Ruins, Blood Wolf Settlement, and Sherekhan Necropolis. ◈ If your character is at least Lv. 56, NPC Durgeff the Chief of Duvencrune will give out Dragon Slayer Weapon Blueprint Bundle x7 once per Family. ◈ If you possess a Garmoth's Heart item, you can go to NPC Hughol of Duvencrune to accept the following weekly quest to process Garmoth's Heart. ◈ The following Special quest can be done in Drieghan with characters Lv. 58 or up that have done the Drieghan main quest Collecting Samples. The quest can be accepted from the Black Spirit. ◈ To gain knowledge on Garmoth, you can accept the quest About the Crimson Dragon Garmoth from NPC Odelphin, the Head of the Mercenary Office at Duvencrune. ◈ The following story quests about Drieghan after the Great Battle can be done after completing the Drieghan main quest A Gift for a Hero. ◈ The following series of quests can be accepted by characters at least Lv. 58 and have completed the quest A Trustworthy Friend. The first quest of the series can be accepted from NPC Odelphin in Duvencrune. 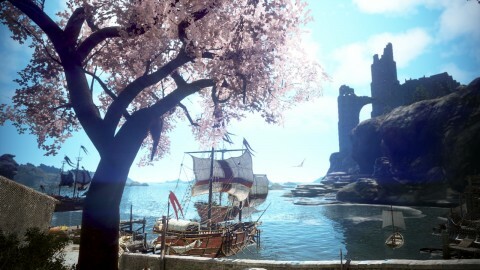 ◈ The following series of quests can be accepted by characters that have completed the following quest series: Hoom's Song, An Archaeologist at Tshira Ruins, Drieghan main quests. Go to the office of Durgeff, Chief of Duvencrune, and interact with an old book there.